· Hand painted in vivid & natural colors. · 50cm High, 11 Dissectible Part. · Fully illustrated color instruction Manual. Life size sexless torso showing visceral organs mounted on a base, composed of 8 parts, major organ systems are represented with great attention to accuracy and detail.. Structures are numbered and identified on the accompanying key card. A very useful and beautiful model of natural size dissectable in to 10 parts without stemo abdominal wall but ribe, stemum, clavicle with their attachments. -Dissectible in to 14 parts. 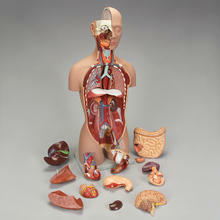 -Brain, Lungs, Heart, Liver, Stomach, Intestines. 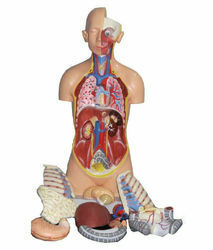 -Male genital parts & female genital parts are removable.